Before its scheduled launch on April 22, the Realme 3 Pro has been spotted on Geekbench, which reveals a few details and specifications about Oppo’s former sub-brand’s upcoming smartphone. Being a Realme device, it wasn’t anticipated to have a high-end CPU but the company’s CEO had earlier said that the Realme 3 Pro will be able to run the popular mobile game Fortnite. The game requires a good CPU and GPU to run and that’s why many mid-range performers lack the capability to run the game. Even the Redmi Note 7 Pro or the Galaxy A30 are not capable of running the game even though they possess a good mid-range chipset. But as mentioned by the CEO of Realme, that the Realme 3 Pro will run Fortnite and he even went on to reveal it on Twitter about the game. A teaser of the Realme 3 Pro was posted where it showed that the device was capable of running Fortnite at 60 frames per second. The teaser made one thing clear that the Realme 3 Pro will have a good gaming performance and it will come with a good CPU and GPU integration. The new Geekbench results show that the Realme 3 Pro runs a Qualcomm Snapdragon 710 SoC coupled with 6GB of RAM. This is no doubt better mid-range specification than some of the mid-rangers we see in the market today. Also, the phone’s model number is ‘RMX1851’ and it was also spotted on the Bluetooth SIG listing which revealed further details about the upcoming device. According to the listing, the Realme 3 Pro will come with a 6.3-inch Full HD+ display along with a fingerprint scanner. It will have Bluetooth 5.0, 5GHz Wi-Fi and will pack a 3,960 mAh battery. The listing further reveals that the device will run Android 9 Pie skinned with ColorOS 6 out of the box. Earlier teasers along with the camera samples of the Realme 3 Pro showed that the smartphone will have a selfie camera of more than 12MP, but less than 25MP. Furthermore, the rear camera of the device is speculated to be a dual rear camera setup with 48MP as the main camera paired with an unknown secondary camera. When launched, it will compete directly against the likes of Redmi Note 7 Pro, which comes with a rear-camera setup of a 48MP paired with a 5MP sensor. Meet hyperboost, the performance boost you need for a speedy and seamless gaming experience! We are super-excited for #realme3Pro.Are you? Comment with a 🙌🏻 and show us your excitement! 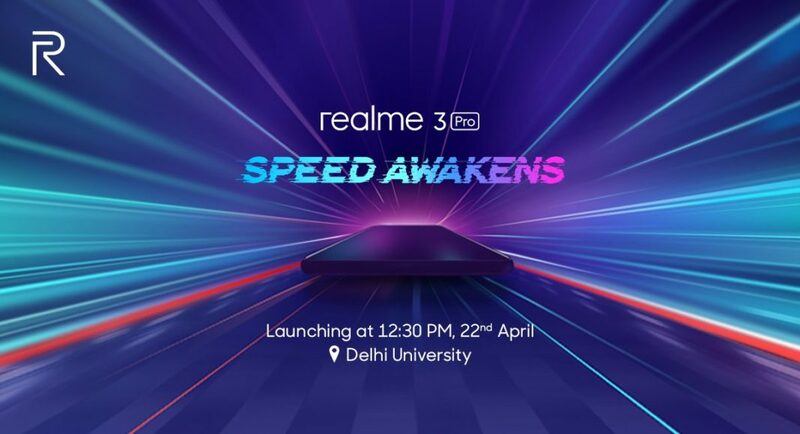 The launch date of the Realme 3 Pro has been set for April 22 and it will be launched at an event at the Delhi University. The pricing and other details of the phone is currently not known and we will have to wait till the launch of the device to find out.